There was a lot of media scrutiny surrounding the Cleveland Browns after they fired head coach Hue Jackson in the middle of this season. Yet, as it turns out, relieving Jackson of his duties has been the best thing for quarterback Baker Mayfield. The former Heisman Trophy winner has torn the NFL apart since Jackson's firing, owning a 114.4 passer rating dating back to Week 9 -- good for fourth-best among the 35 quarterbacks who have played during that span. Before Week 9, Baker Mayfield ranked 27th of 32 quarterbacks in passer rating (78.9). Since Week 9, Mayfield ranks fourth of 35 quarterbacks (114.4). ​​It should also be noted that the Browns are 3-2 since Jackson's firing -- they won three times in 40 games under his watch. 78.9 - 27/32 qualifying QB rank. 114.4 - 4/32 qualifying QB rank. While Mayfield has been incredible in the second half of the season, he could be a risky start for anyone in their fantasy playoffs next week at the Denver Broncos. Their defense has been a little better than above average in terms of allowing fantasy points, and the high altitude of the Denver air has presented problems for many opposing teams on a routine basis. If fantasy owners can break through to the finals, awaiting them is a pristine matchup for Mayfield in Week 16 against a Cincinnati Bengals' defense allowing the second-most FanDuel fantasy points per game (22.6) to opposing quarterbacks. 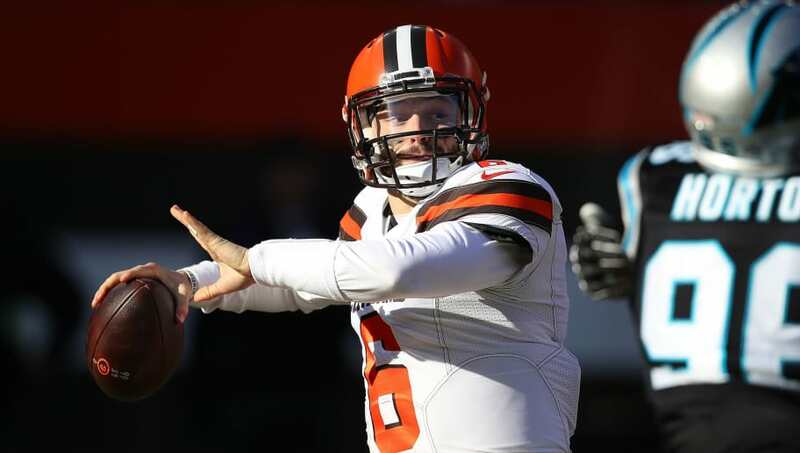 Considering Mayfield completed 73 percent of his attempts and tossed four touchdown passes against the Bengals back in late November, starting Mayfield could be the difference between a win and a disappointing championship loss in Week 16.